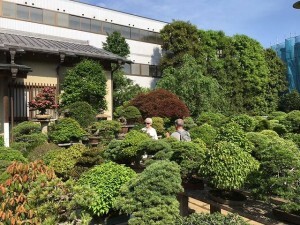 After a stay of a few days in Urawa Saitama City, visiting a Bonsai garden and hidden temple, we flew to Akita airport for a stay at the coast near Oga with little fisherman’s harbor and beach. The railway company bears our family-initials: JR so we could count on a fair and safe trip … . 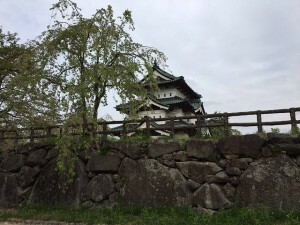 Before heading for Hachiman-Tai high in the mountains we took our time visiting Hirosaki Castle and its park with old and famous trees, ponds and gates. 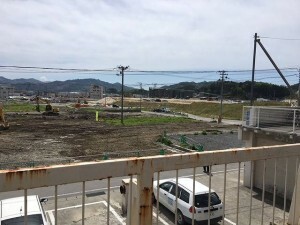 After a little more than an hour drive, there was the World Heritage Sannai-Maruyama Site of the settlement of the Jomon period (5.500 to 4000 years ago). An archeological site with burials, mounds, graves, dwellings and reconstructions of buildings and a tower.The museum helped us to understand life of those prehistoric times.On our way to the mountains we passed many orchards with fruit trees, mainly apples and pears. 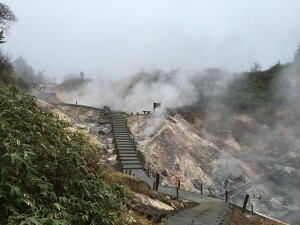 We stayed two nights in Goshokakari-Onsen in the middle of steaming sulpher wells and bubbling mud springs. We hiked in the mist and over path of snow, enjoyed traditional meals and Mr. Yamazaki’s healthy massage. After a drive over the Aspiterine Pass, a beautiful river valley and view on mount Iwate-san, we arrived at our bed-and- breakfast south of Yamada. 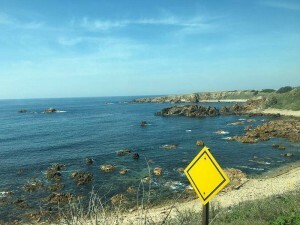 We made a pleasant hike down to the rocky coastline, Jet was happy to enjoy internet connection for contact with our beloved. 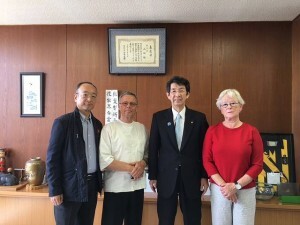 We prepared for the meeting with the mayor of Yamada city Mr. Shin-itsu Sato to hear about the progress of the restoration after the tsunami 5 years ago. 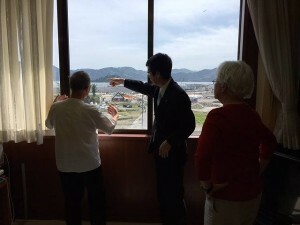 He took his time to explain and show from the window of his office how destructive the wave was and how the rebuilding proceeded. It was for us a great honor to have met him, we thanked him for his hospitality and made him and his council compliments for their efforts. Leaving the city we took our time to watch the proceedings in town and at the seashore. 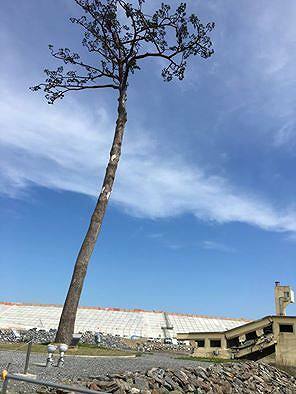 We also hiked to the famous tree of the seashore Woods that solitary survived the waves that washed away the whole beach forest. After a long ride following the coast with many towns and villages that suffered the Tsunami we arrived at the beautiful bay of Matsushima.The next day we sailed around a group of islands before the coast and visited a wonderful temple complex with precious gardens. 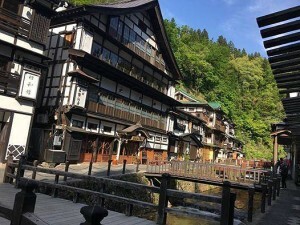 Still we enjoyed sunny weather, so when we arrived in the mountains of Ginzan Onsen, we could hike along the Mogami river with its waterfalls to the in the former silver mines above the village and stroll around. We needed the relaxing time in the hot bathes before heading for the big city.The day before we left we made a tour around a charming lake surrounded with blooming bushes and visited an outside bath with splendid view on the river-valley. 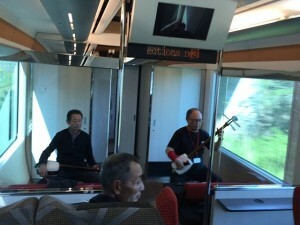 On the 17th of May we arrived by shinkansen at Tokyo where we spent some days. We went to the Kabukiza Theatre where we enjoyed two Kabuki ‘plays’. A very pleasant experience! The next day The Museum of Contemporary Art was a surprise, not only the building but also the special expedition of making animation movies. We also found the Fukagawa Edo Museum where we could wonder through the Streets of old Edo. 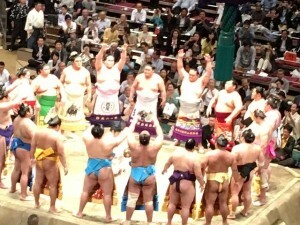 Friday May 20th was Sumo day, an happening we looked very much forward to … and what a show it was! 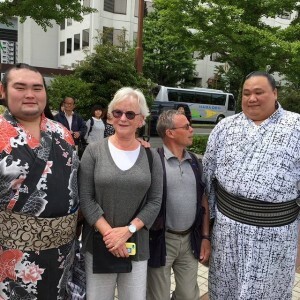 We saw ‘fighter’ Hakuho who the next day became the winner. The last weekend in Japan we took off by Yamanakako-onsen to the mount Fuji region and by car to the mountain. We prepared for the hike on the slopes of the giant. 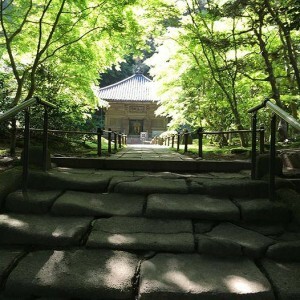 All of us enjoyed a traditional supper with precious conversations.The day the boys went for the mountain, Jet wondered through the village to the holy springs and Oshino Hakkai Ponds. 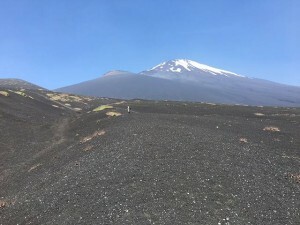 May be she covered more miles than the Fuji hikers!? Their day on the slopes, through the woods between 1200 and 2000 meters high was fantastic with great views to the top and to the valley and spontaneous meetings with locals taking a walk. Joan’s dream came true.The drive back to the Tokyo train took us through the mountains and a region of hot springs again. Tuesday was the day of preparing our journey home. 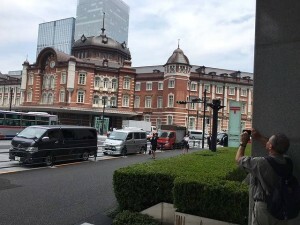 We went a shopping center and or the famous main station of Tokyo. In the afternoon we were put us on the train to Narita airport where we stayed one night in a hotel before flying back on Wednesday the 25th. 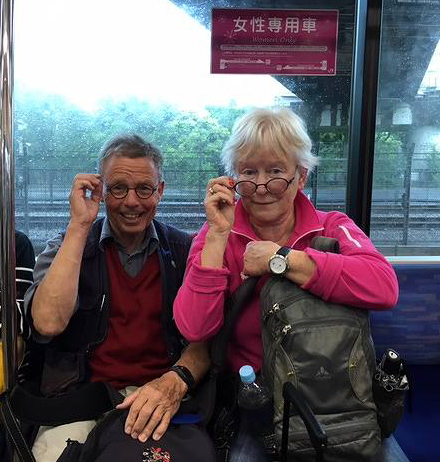 After a pleasant flight and we took the train to Maastricht, met our friends who stayed at our home and started normal life in Maastricht again. 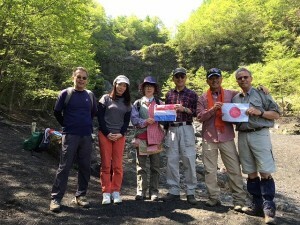 Thanks to FAN friends, we had a wonderful time in North East of beautiful Honsu. A once in a life time experience!